So your restaurant has adjusted to the age of technology, you’ve found some creative ways to keep business flowing all week, you’re heading into your busiest time of the year—the holidays—and you’re thinking to yourself: I just wish I could give back. Whether that’s true or not, you might consider it. Giving back has real benefits that go beyond the heartwarming; it can stir up positive PR, cause an upswing in employee morale, and forge important new connections with other local businesses and leaders. When you buy local you’re investing in your community. You’re also able to buy more often and in less quantity, which means you’ll have less waste, less harmful-for-the-environment packaging, and fresher ingredients. Sure the prices might be a little higher, but, between the ability to market your amazing “farm-to-table” recipes and the customers and referrals you’ll get from supporting local businesses, you should see a return on your investment. You can’t always shop local—especially with the winter months approaching, but you can always use your wholesale power for good. Consider donating any extra non-perishables to your local food bank. Better yet, find out what your food bank needs and try to include some of those ingredients in upcoming menu specials. That way, you’re drawing customers in with exciting new dishes and making a greater impact with your donations. 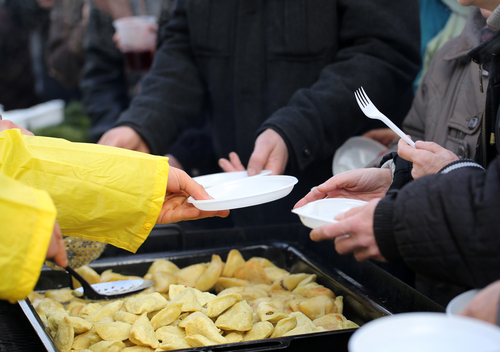 Though the logistics behind donating “leftovers” are a little more complicated, there are plenty of local charities that will happily accept prepared foods as in-kind donation and they can walk you through the tax benefits you’ll receive because of your generosity. It’s what you do best. Pick a holiday and host a festive dinner for those not fortunate enough to have one themselves. If you can’t host, consider delivering meals to individuals or families in your area that are in need. It’s a great way to create good will for your company, introduce your business to new people, build camaraderie with your staff, and see the impact you’re making firsthand. Get involved in your local school systems. Schools can benefit from many of the types of giving we’ve already mentioned, but you can get creative with ideas like incentivizing kids to keep up their attendance and grades with special lunches and coupons. One free kids meal with the purchase of an entree is a great way to get more families in your door. Not everyone has the ability to donate their time. If that’s the case for your restaurant, try designating a day of the week where a percentage of sales will go to a charity of your choice. Charities know what they need and giving them the financial resources to meet those needs is one of the best ways you can help. Plan it on a day of the week when business is slower and watch as business picks up.